Due to it’s 99.99% purity, the Canadian Silver Maple is one of the most sought after ‘bullion’ coins, meaning that it is often bought for investment purposes. The Silver Maple Leaf has been minted by the Royal Canadian Mint since 1988. It is one of the purest silver bullion coins on the market – 1 ounce (31.1g) of 99.99% Silver. Although the face value is 5 dollars, the coin is generally sold based on its silver value, although they do attract quite a premium over the spot price. The Obverse is the head of Queen Elizabeth II. There has been three designs showing a young head, an old head and an older head. The edge is reeded. Diameter is 37.97mm and thickness 3.18mm. The Reverse always has a maple leaf depicted, the National Emblem of Canada and hence the coin’s normal reference title in numismatic circles as a ‘Maple’. The original design was by Dora de Pedery-Hunt (1913-2008), a gifted Hungarian born artist and sculptor who emigrated to Canada in 1948. Above the maple is the word ‘CANADA’, to each side is ’9999′ confirming its purity and always below is the phrase ‘Fine Silver 1oz Argent Pur’. Maples are great coins for any collection as they have both numismatic and investor interest. 25 x 1oz Silver Maple Leaf Coins 2019, Canadian Mint. Full Tube Total 25oz. 2016 1oz Silver Canadian Maple Leaf. 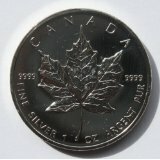 New Uncirculated 2011 Canadian Silver Maple Leaf 1oz Silver Bullion Coin. 2016 Canadian 1.5 oz multi maple leaf 999.9 Silver Bullion Coin.